From left to right, Vinton Elementary School Principal Leslie Henry stands with fourth grade student Jillian Hall. Hall scored a perfect score on the state math assessment test in spring of 2018. Gallia Local Schools Board of Education and Vinton Elementary School recognized her for her achievement at Monday’s board meeting. 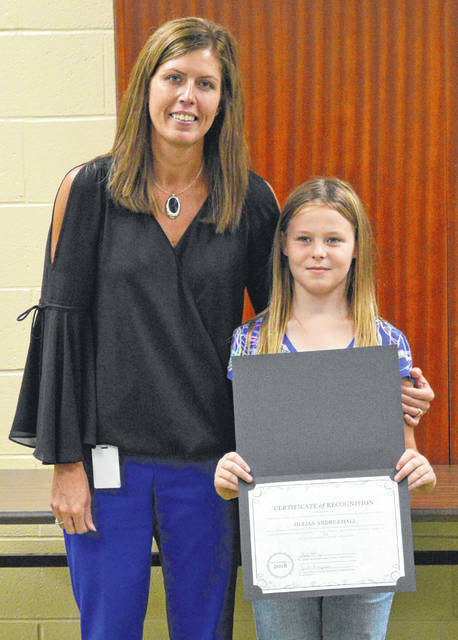 https://www.mydailytribune.com/wp-content/uploads/sites/42/2018/09/web1_DSC_0263.jpgFrom left to right, Vinton Elementary School Principal Leslie Henry stands with fourth grade student Jillian Hall. Hall scored a perfect score on the state math assessment test in spring of 2018. Gallia Local Schools Board of Education and Vinton Elementary School recognized her for her achievement at Monday’s board meeting.